These cinnamon rolls are pure magic! 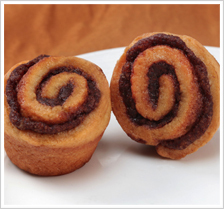 Inside, we start with a delicious cinnamon swirl with a touch of brown sugar for just the right amount of sweetness, then enrobe each roll with a honey glaze. As if that weren’t enough, we offer varieties that are topped with a sweet drizzle or a smear of real cream cheese.